Players of the Wilfrid Laurier University women’s soccer team are caught in limbo this summer. 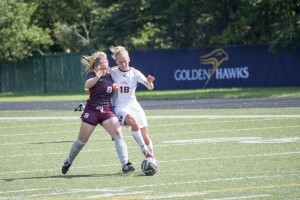 K-W United FC, a local W-League club where many of the Hawks played during the last two Laurier offseasons, was suddenly discontinued, leaving many players without a ground to train this summer. However K-W United wasn’t the only casualty. Three other W-League teams, including Toronto, London and Ottawa, also decided not to continue, leaving only two Quebec teams and leaving many athletes across Ontario without a club. The two remaining Quebec squads would move into one of the American divisions to continue playing in the W-League. Fourth-year Laurier striker Emily Brown has decided not to play soccer at all over the Laurier offseason, but rather is following a gym program set out by a trainer. However when it comes to playing soccer, Brown will have to seek an alternative method. “It was a shock to everyone,” Brown said. Athletes still have the opportunity to play for lower-level leagues such as rep teams and local teams, but Brown realizes it will be difficult to find the level of competition the girls that play for teams like Laurier need in order to remain competitive over the summer. “It’s a shame because there’s so much talent and there’s so much potential for girls of this caliber that now don’t have anywhere to play,” she said. On top of losing the chance to play, Laurier is also missing out on another front —recruitment measures. Over the past few years, Laurier benefited from the increased exposure of having a competitive club playing in Kitchener-Waterloo. The club plays at University Stadium and attracts players from around the country. Current Laurier member Maxine Murchie transferred to Laurier from the University of Central Florida after playing soccer with K-W United two years ago. Brown believes this is one of the main components Laurier will be missing out on with the club’s sudden discontinuation. “I think a hard part too is K-W brought really talented athletes into the region and exposed them to Laurier, so we did get a few recruits through that program. We got some really great players from that so I think we lose on that front,” she said. Not only will Brown and her teammates be missing out on the chance with each other, but the team will also be missing out on prime bonding time, as in the past the Hawks have been able to take advantage and build chemistry that translates into the school season. However Brown was not overly concerned with the potential of losing that chemistry. “K-W United came in at a time when we were a really young team and we had a lot of new players and we were still developing,” Brown explained.